Historically, Waikīkī encompassed fishponds, taro lo‘i, coconut groves and a reef-protected beach that accommodated Hawaiian canoes. Waikīkī shifted from agricultural to residential uses, with private residences for the Hawaiian royalty and the well-to-do. Near the turn of the 20th-century, some of these homes were converted into small hotels and eventually into world class resorts. Robert Lewers (whose firm Lewers & Cooke supplied much of the lumber for O‘ahu homes) built a two-story wooden frame bungalow with an open veranda overlooking a coconut grove in 1883. Then, in 1907, Edwin Irwin leased the Lewers’ house and converted it into a small hotel called the Hau Tree. Nearby, the J Atherton Gilman family bought 3-acres and built a two-story house from a man named Hall. La Vancha Maria Chapin Gray rented the Gilman house in 1912 and converted it into a boarding house and named it Gray’s-by-the-Beach. The sandy area fronting it was soon referred to as Gray’s Beach. 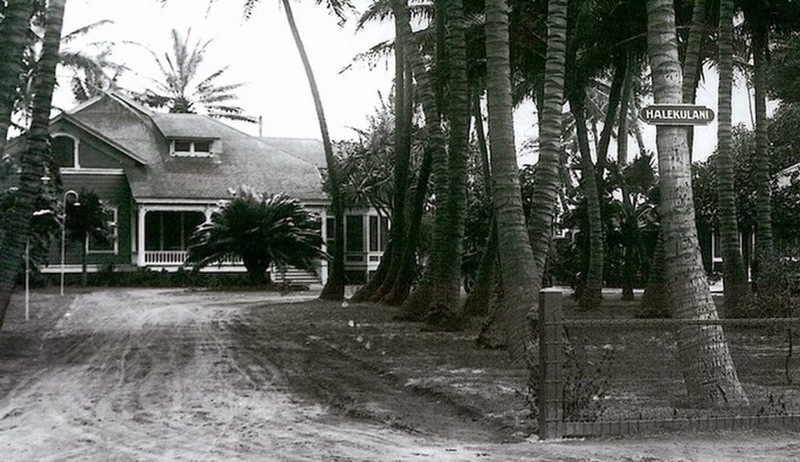 In 1917, Clifford and Juliet Kimball acquired the Hau Tree Inn near Gray’s Beach and, in the late 1920s, they decided to expand and bought the Gilman property, including Gray’s-by-the-Sea and an adjacent parcel belonging to Arthur Brown. The principal character in the story was Charlie Chan, the celebrated Chinese detective, patterned after a Honolulu detective named Chang Apana. The beach in this area is a place of healing called Kawehewehe (the removal.) The sick and the injured came to bathe in the kai, or waters of the sea. It’s now a small pocket of sand nestled between the Halekūlani and the Sheraton Waikīkī. Kawehewehe takes its meaning from the root word, wehe (which means to remove) (Pukui.) 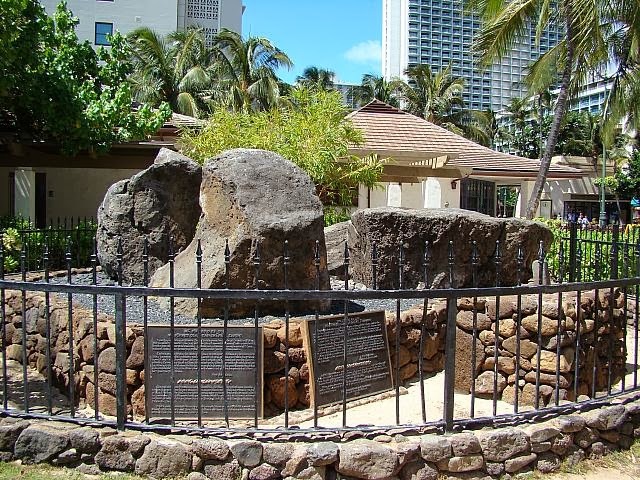 Thus, as the name implies, Kawehewehe was a traditional place where people went to be cured of all types of illnesses – both physical and spiritual – by bathing in the healing waters of the ocean. There was a Kawehewehe Pond; people with a physical ailment would come to the pond in search of healing. A kahuna, or priest, would place a lei limu kala around their neck, and instruct them to submerge themselves in the healing waters of the pond. Gray’s Channel heading out from the beach was a natural channel through the reef off the Halekūlani Hotel. It was enlarged by dredging in the early 1950s to allow catamarans to come ashore at Gray’s Beach. Popular surf sites are just off-shore. Eventually, the Norton Clapp family of Seattle bought Halekulani, by now consisting of a large Main Building and 37 one and two-story bungalows. The image shows the Halekūlani entrance (Halekūlani – sometime before 1917.) In addition, I have added others similar images in a folder of like name in the Photos section on my Facebook and Google+ pages.